In the desert on the outskirts of Dubai, one of the world's biggest gold refineries is under construction. When completed next year, it will help to alter the balance of power in the global gold industry. Growth in demand for the precious metal is shifting east, to Asia's fast-growing economies. But key industry activities such as refining and clearing - matching investors' buy and sell orders - remain dominated by Europe and the United States. 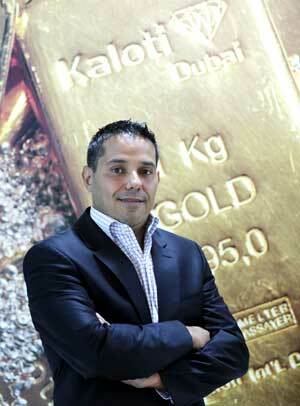 "Dubai is already a top global centre for gold trading," Tarek El-Mdaka, chief executive of Kaloti Precious Metals, said in an interview. "The refinery is part of the next stage, making Dubai a top centre for physical gold refining and clearing." If Dubai succeeds, it will be a new example of how the emirate can use its proximity to top consumers in India and China, low-tax environment and highly developed transport sector to muscle in on industries controlled by others. Gold imports and exports handled by Dubai shot up to $75 billion in 2014 from $6 billion in 2003; nearly 40 percent of the world's physical gold trade passed through Dubai last year, according to the Dubai Multi Commodities Centre. But the region's refining clout has lagged. Annual capacity in the United Arab Emirates is about 800 tonnes, including a 450-tonne refinery currently operated by Kaloti; Switzerland dominates the industry with over 3,000 tonnes, accounting for roughly 50 percent or more of global refining. Kaloti's new refinery will have an annual capacity of 1,400 tonnes of gold and 600 tonnes of silver, making it more than three times the size of any of the UAE's current refineries. The project is a bet that gold demand in Asia will grow strongly in coming years. That cannot be guaranteed; last year India, seeking to cut its current account deficit, imposed a record 10 percent import duty on the metal. Global gold demand shrank 15 percent to 3,756 tonnes last year, according to the World Gold Council, an industry body. But Munir al-Kaloti, president and founder of Kaloti, said he saw little risk of a long-term interruption to growth that has seen the firm's precious metals output and physical trading grow at average annual rates of 25-35 percent since it was set up 25 years ago, to over $30 billion in 2012. "This isn't just about Dubai. It's about a trend that is bigger," Kaloti said at his offices on the 35th floor of a skyscraper, the new refinery's site visible in the distance. Born in Jerusalem in 1943, Kaloti arrived in Abu Dhabi almost penniless in 1967. Kaloti started out in Dubai selling foodstuffs to the local armed forces and trading non-ferrous scrap metal. His conglomerate now contains real estate development, carpet manufacturing and other businesses. At present, London plays a dominant role in accrediting gold refineries globally; the London Bullion Market Association (LBMA) runs a Good Delivery List of certified refineries. This can be a source of frustration to refiners outside Europe, some of whom feel the system is skewed towards Western firms. Kaloti has not managed to obtain a place on the LBMA's List for its current refinery and says it is now waiting to request that status for its new refinery. "London needs to be more flexible and recognise the trend," said Kaloti, whose company also plans to open a gold refinery with an initial annual capacity of 50-75 tonnes in Surinam this August, to tap into business in that region. Dubai's drive to develop exchange-based trading may be as important to its growth as a gold centre as expansion of its refining capacity. In April the Dubai Gold and Commodities Exchange, which currently trades gold futures, said it would introduce a spot gold contract this June. The exchange is in the final stages of finalising specifications but the contract is expected to be for 1 kg (32 troy ounces) of 0.995 purity gold, the type favoured by Indian consumers and investors. Becoming a top centre for exchange-based spot trading of gold would require Dubai to expand its infrastructure in new ways; for example, it might need to host substantial operations of bullion banks, which are investment banks that function as wholesale suppliers to the market. Mdaka, a member of an advisory committee for the spot contract, acknowledged the challenges but said Dubai would tailor its 1 kg contract to appeal to the jewellery industry and small investors in a way that other centres did not. Shanghai, Mumbai and Istanbul trade spot contracts but foreign participants can face restrictions there; London's over-the-counter market involves counterparty risk and trading focuses on 12.5 kg bars, which are ideal for central banks and institutional investors but not for smaller buyers, Mdaka said.